Need to get to the airport in the dead of night? Looking for a reliable driver to collect you? Need a regular driver to take you somewhere? 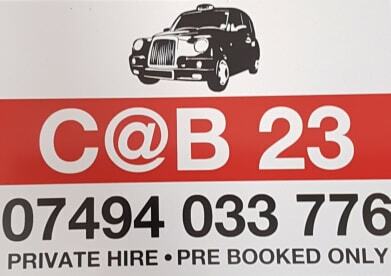 At C@B 23 Taxis, whatever you need, our reliable taxis and our professional, friendly drivers will arrive on time, every time. Our dedication to getting you from A to B in safety and comfort mean you'll never have to worry about your Cambridge journey again, so drop us a line on 07494033776. Please note that C@B 23 Taxis may not be able to honour booking requests made.